Sage One 9' 7wt. with "Ol' Faithful"
I've said it here before. I'm usually not on the cutting edge when it comes to buying the newest tackle. I can't afford to be! I fished with two Sage One series rods this year, a 9' 7 wt. and a 12' 6" 7 wt. I know the Ones are several years old, but they are the nicest rods I've ever owned. I was able to unload a lot of gear this year and I picked up a lot of gear at very good prices. The trick is to not be in a hurry and to wait until the right thing pops up used or on sale. Also, buying gear from Canada (with a very favorable exchange rate) saved me an awful lot of money. 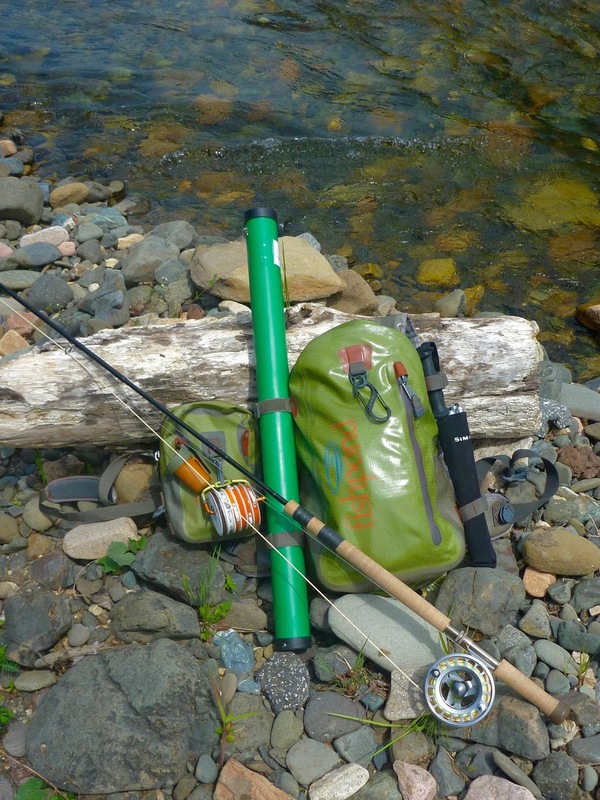 The Sage One 790 was a closeout demo model from a local fly shop, UpCountry Sportfishing. At first, I checked it out and decided to pass. Trout fishing was slow that afternoon and I kept thinking about the rod. I wound up driving back to the shop, trading in my old Echo 4106 switch rod, and walking out with the One. My old Sage Graphite II rod is getting long in the tooth, plus I wanted a 7 wt. that would work well with my favorite reel, the Islander IR4. The One and the IR4 balanced well together. This combo is so much lighter in hand than my old 7 wt. outfit. It throws laser loops, but I feel like I have been fishing a 5 wt. trout rig all day long. I acquired my Sage One 7126 in a straight trade for my TCX of the same size. Though technically I got this rod in 2015, I didn't really use it until a trip to Canada in June 2016. What a rod! It's so light, it felt like I was using a switch rod. Goodbye fatigue. Paired with a Danielsson L5W 8twelve, a 480 gr. 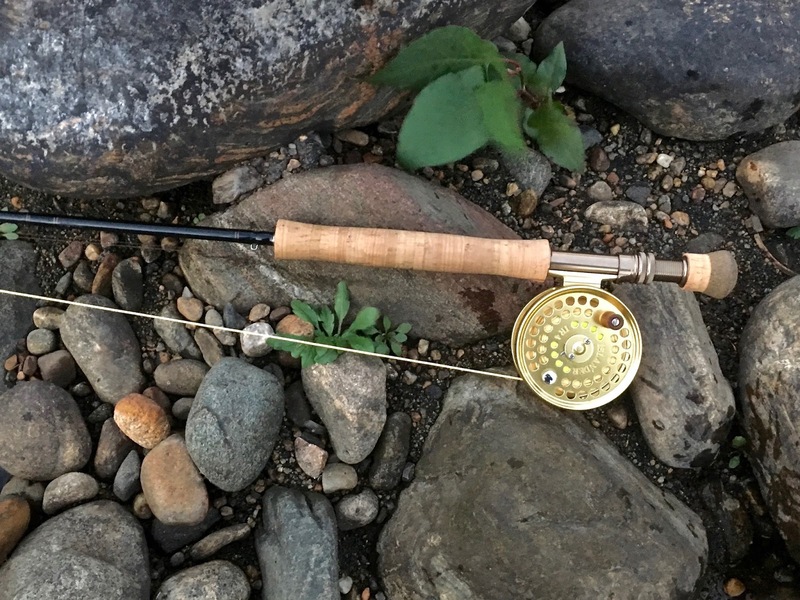 Rio Scandi head, and a Rio GripShooter running line, the combo performed admirably, landing salmon up to 15 lbs. I really like having a downlocking reel seat again. I wouldn't mind having a larger, more robust version of this rod, maybe an 8136 or a 9140. I bought an inexpensive used Redington CPX 9139 in case I needed a beefier combo. I paired it with a borrowed Loop Classic 8-11. I wasn't too crazy about this pairing. It felt too clunky and it was tiring to cast. Also, I'm not crazy about classic style, S-handle reels. I suppose I'm glad I have this rig though, just in case I need it. Like I said above, I wouldn't mind replacing it with something like a comparable One or an X (and a different reel), but I'll worry about that the next time I plan on fishing a river with large, early season salmon. 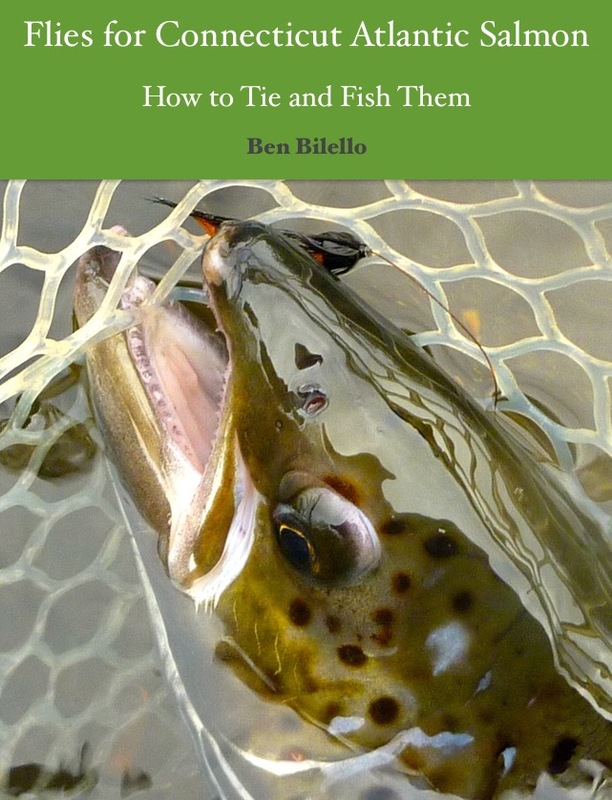 I replaced some trout fishing gear this year too, which was long overdue. For many years, I fished with an Echo II 9' 5 wt. rod. It always felt too stiff. It had no feel. Since most of my trout fishing is with dry flies, I like a rod with a more moderate action. I picked up a closeout Beulah Platinum 590 for a song. I paired it with an Abel TR2. I would have preferred to pair it with an Islander IR3, but I didn't find one in time (I wound up finding one later and paired with my Orvis TLS 4711). Anyhow, I like the Abel TR2 a lot. I wish the drag was adjustable from the outside but, other than that, it's a really terrific reel. The Beulah rod was just what I was looking for. It has way more feel than my old Echo. 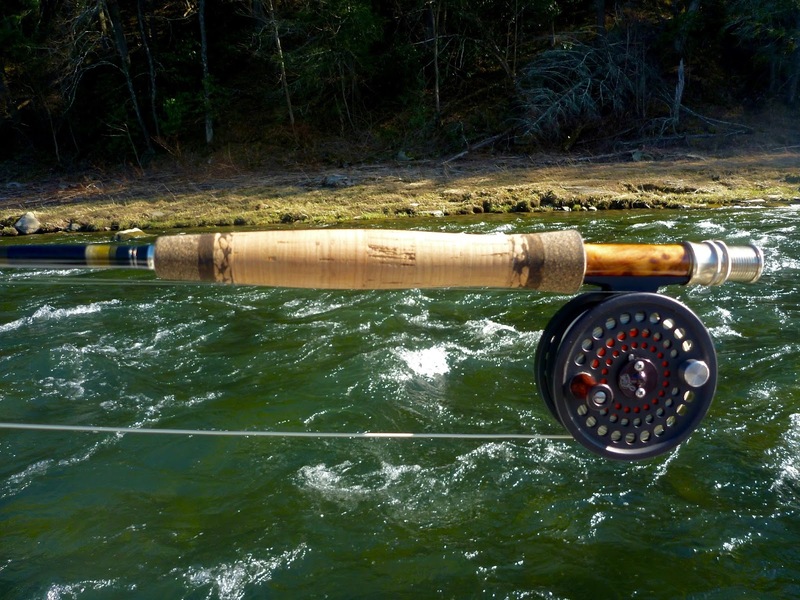 It's a very nice dry fly rod. My main trout fishing setup is a 4wt., so I didn't use this 5 wt. rig as much as I would have liked to. I caught my personal best dry fly trout with it though, so I can't complain! After losing a piece of my Ross Reach 7119 during shad season (then being reunited with it), I decided to get another. I never found one for a good price, so I bought a Ross Reach 6126 while they were on closeout at Sierra Trading Post. This was back when there were still 35% and 40% off STP coupons. The 6126 throws the same lines as the 7119, so I'm safe in case anything happens to one. I never got a chance to try it, so it will have to wait until next spring. It's a shame Ross Reach rods are no longer made. I picked up a couple of inexpensive reels, too. I found an old Scientific Anglers System 10 (same as Hardy Marquis Salmon 1) and paired it with my Sage Z-Axis 6110. I wish I had a chance to use it more, but I'm sure it will get a workout next spring. I also got a cheap, used Orvis Battenkill IV as a backup for my Abel Classic Switch. It seems like an ok reel. It's definitely not as nice as the Abel, but it is a lot less expensive. The click drag is a little too tight, so I fiddled with the spring to loosen it up. Next shad season, I'm planning on keeping a different density line on the Abel, Orvis, and SA reels, then bringing two rods with me to make experimenting with depth easier. It sounds like a ton of gear, right? I have all the drum gear I need, plus I was good about selling an item of fishing gear almost every time I bought a new item. Like I said, I had to wait for my price on a lot of items, but I saved money in the end (as much as possible when spending it on this silly stuff). I don't have much more gear than I had at this time last year and my wife is none the wiser! Patagonia Foot Tractor Wading Boots...don't use on wood floors! 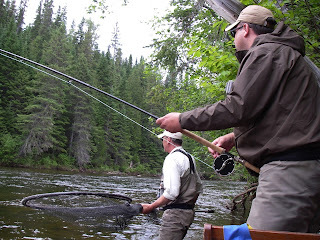 This was the first full season I used my Patagonia Rio Gallegos zip-front waders. I got these at the very end of last season, so they are the previous generation. They are very roomy up top, but that made them perfect for cold weather layering. I was very impressed with how comfortable they are. The Rio Gallegos are much more comfortable than my old Simms G4 Pro waders (stiff). Sometimes I forget I'm wearing waders. Time will tell if they are as durable as the Simms but, at the moment, I much prefer the Patagonia waders. I will probably buy a new pair of the current generation Rio Gallegos next year. Supposedly, Patagonia refined the fit so they aren't as baggy as the old ones. I'll save the old ones for late fall through early spring and use the newer model throughout the warmer months. I am really glad I made the switch to Patagonia. I just got a pair of Patagonia Foot Tractor wading boots a couple of weeks ago. So far, I like them almost as much as the waders. I have always been a felt boot fan, so I was a little skeptical. Man, those aluminum bars grip! If I had them a week sooner, I might not have fallen onto those rocks, bashed up my left leg, and tore a calf muscle. Sometimes I feel the bars slide a tiny bit, then they catch. They are much easier to get on and off than my old boots, which is a plus. My complaints are minor. They are sort of heavy, so I will probably use other boots for long hikes. Also, I wish they drained a little better. They grab hold of the bottom so well, it's easy to forget those two things. The Patagonia Foot Tractor wading boots will get their real test in the spring when the American shad, striped bass, and seatrout ascend their gnarly rivers. Last season, I left my Fishpond Nomad mid-length net on the roof of my car, only to have it fall off and get crushed by an eighteen wheeler. I was bummed. It was a little too small for my needs, so it was the perfect time to replace it with the Fishpond Nomad El Jefe net. 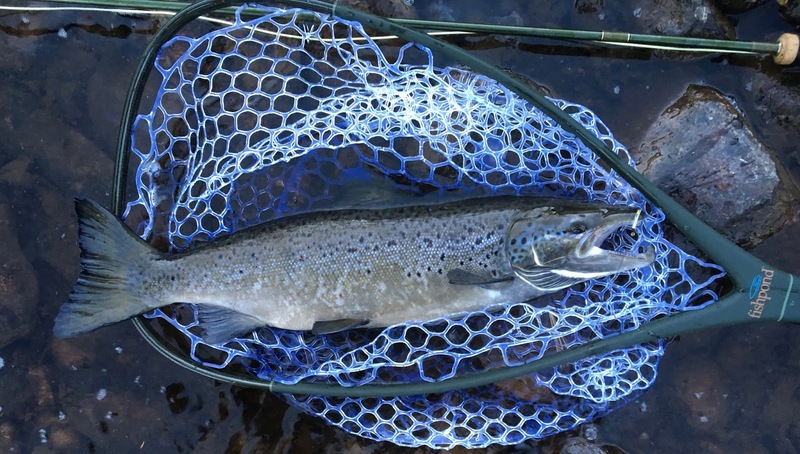 The El Jefe is a little longer than the mid-length net and has a slightly larger, deeper basket. Otherwise, it is pretty much the same great wading net as my last one. It also doubles as my wading staff. The largest fish I fit into the El Jefe was about 28". That salmon had to be "folded" a little. I don't think it would work for a fish much longer than that. As a sidenote, the El Jefe didn't fit into my Smith Creek net holster as well as its predecessor did. The El Jefe slid around too much. I'm going to go back to the drawing board on this one and figure out a solution in the spring. In addition to making great products, both Patagonia and Fishpond should be commended on their ethical business practices and their commitment to keeping our environment as pristine as possible. If you have a moment, click the following links to read more about the respective corporate responsibilities of both Fishpond and Patagonia. I am very grateful to be affiliated with such socially responsible companies. At long last, a double-sided Tacky fly box! I'm a big fan of Tacky Fly Fishing's fly boxes. When I get the periodic Orvis $25 off $50 purchase coupons, I use them to buy hooks. I had just received a coupon in the mail and was looking at the Orvis site when I noticed their joint venture with Tacky. Double-sided Tacky boxes! There is one with the normal Tacky slit material on both sides. The box I bought has the normal material on one side and the Tacky Big Bug slits on the other. 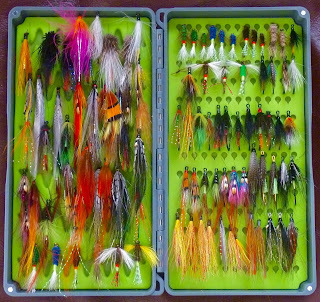 I could finally cram almost all of my broodstock salmon flies into one Tacky box. Plus, with the coupon, it was pretty inexpensive. Well, that's it for 2016. Thanks again for reading and I appreciate the feedback. Let's hope for more water in 2017. Have a happy New Year!